Leonardo Da Vinci ended at the Louvre. Violeta Parra started there. … the province of Ñuble touches the full Andean summit, whose people work and indulge in some two hundred years of backwardness… But their antiquity transmits sagacity, in a past that is deeply profound, holding a perfect pulse on memory. The day that I do not have a love to dedicate my songs, I will leave my guitar in a corner and let me die. Violeta Parra didn’t “start” at the Louvre. It was one stop on her long path, closer to the end of it than the beginning, and all in all, perhaps furthest from her heart. 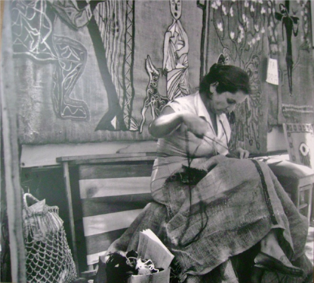 She may have been the first Latin American artist — and the first woman — to exhibit there, but she started out in the foothills of the Andes, in a village of southern Chile, with parents who both loved music but who gave her a humble life in rural poverty, especially after her hard-drinking father died and left the family in dire misery. Little Violeta became a largely self-taught itinerant performer along with her sister, traveling as a singer with the circus as she grew a bit older, but often she traversed her long country alone or with her children. 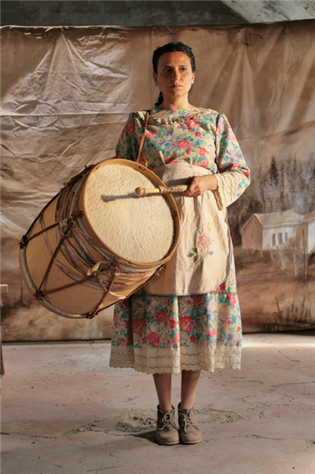 She collected and transcribed the region’s traditional songs, composed comparable but original music and lyrics herself, toured internationally, wrote about the folk culture of the “southern cone,” programmed it for the radio, and went on to write poetry and create embroidered burlap tapestries, ceramics, and oil paintings that further expressed the experience and legacy of indigenous and mestizo Chileans who shared her history. Marginalized from the middle and upper classes, city life, and the elite who were educated privately and abroad, she identified with campesinos and miners from the countryside rather than the consumer culture imposed by North America and Europe. From native soil she grew into an icon for Chile’s liberation from modern Western cooptation and neocolonial dominance, and as such, she was considered the mother of nueva canción, Chile’s own music “of the people.” “Create from what there is,” was her motto, and she contributed more than 3,000 songs and other works of art to what became a national archive. 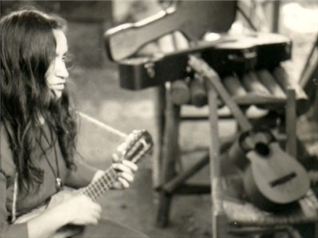 Some twenty of those songs are featured in the first theatrical film about Violeta Parra, by the same director who gave us the poignantly political and lyrical Loco Fever and Machuca, Andrés Wood. 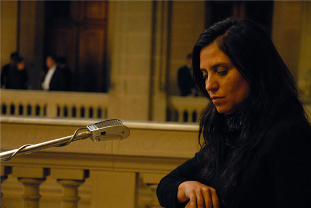 Those who normally don’t stick around for the end credits of films will miss a special composition by the singer as Violeta Went to Heaven closes — what is considered by many to be Chile’s second national anthem, the ironically celebratory song, “Gracias a la vida” (“Here’s to Life”). 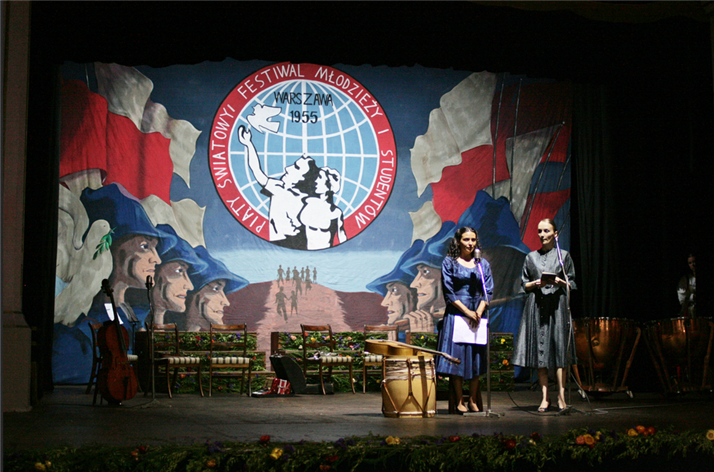 No one from Andrés Wood’s cast or crew was there to hear it, but a diverse local audience clapped vociferously as the credits rolled at the end of Violeta Went to Heaven in Los Angeles — a small audience, like the one on the screen that applauded at the end of Violeta’s final performance, people who were surprised and deeply moved. “But it was so sad,” our North Americans murmured as they left the tiny art-house projection, as if sadness were not a part of life, as if it were not a defining component of beauty. For what the film has on offer is nothing less than a treasure trove of beauty, and we are hard-pressed to say what shines more in any given moment — the unique gift of the protagonist Violeta Parra’s poetry and song, the astonishing performance (both acting and singing) of the lead actress Francisca Gavilán, the yet again striking cinematography of Miguel Ioan Littín, the strident editing by Andrea Chignoli, or, before and after all, the ingenious multi-layered screenwriting of Eliseo Altunaga, Rodrigo Bazaes, and Guillermo Calderón along with co-writer and director Andrés Wood, who departs here from his previous superb work by basing this strongly lyrical film on the biography of Violeta Parra written by her son, Ángel Parra, who served as Wood’s creative advisor as well. This is all a mouthful. Well, Violeta Went to Heaven is an earful and an eyeful! It deserves more than praise for the individual talents creating it and more than seven days in a small art-house theater; but on another level, it also feels as if it will be around for a long time. Thanks to Cinema Tropical in promoting the film and to Kino Lorber for releasing it. How to navigate the torrent of emotions that is Violeta Parra, someone who straddled continents and centuries via her research and presentations and yet somehow drew deeply and even strictly from her own life and identity? Andrés Wood has chosen to show her subjectivity. In many ways as fearless as the film’s namesake, he is bravely lush and inventive while never veering from the earth, the fauna, the vast skies that endow her spirit, and especially from the people who spur her imaginative powers. Wood and his longtime visual collaborator Miguel Ioan Littín are the most agile of poets in pinning down personal moments in this international icon’s life without ever compromising the pacing or atmosphere in the film. 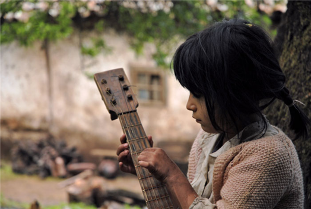 Cues for structuring the film seem to arrive intact from Violeta Parra: the work as a whole is never a linear narrative but rather a series of discrete episodes, quiet bursts of emotion that evoke others, that dovetail and double back on each other, songs that lead us to images as testimony, impressions that linger as they come full circle. It’s the interior point of view of Violeta, and as contradictory as it may be, and often painful to experience, it registers as authentic and valid. American woman who revived her country’s artifacts and folklore in her art and her personal life — Paul Leduc’s Frida Kahlo: Naturaleza vida — indelible moments, shards of a life, envelope the screen intermittently as anachronous fragments, exploding with meaning in a rhythm of their own. Yes, sound evokes images, but we are endlessly surprised by what we see in Wood’s film, and when we see it. An off-screen creaking followed by flapping in the wind introduces us to the landscape that is Violeta’s, and though these omens haunt the entire film, we don’t see their images until the end, when their meaning suddenly billows with emotion. What does appear at the opening, after a black screen with the mysterious voice of a woman calling out to a girl, is an extreme close-up of a human eye, the face lying on its side and the eye staring at us in silence. It doesn’t move. Only the camera moves, and hardly, holding its focus the way it did in an iconic portrait of Ché Guevarra — of his corpse. As fog finds its way over tree-covered slopes, the camera tracks a guitar moving through the woods with the swishing of a woman’s peasant dress and the crunching of her feet over twigs as she strides. This fictional series of interviews is one framework in which Violeta’s life unfolds before us. Edited neither as flashbacks nor flash-forwards but in a scheme that traces Violeta’s emotional trajectory in her singular world view, it is juxtaposed with the framework of her actual domestic life. She often neglects her own children much as her father neglected her, though he is seen teaching music to a classroom of children, including his own, when he is not terrorizing them with his drunken violence. A third framework of the film is the natural environment of the folk lore Violeta researches. From this terrain arrives a Swiss man, Gilbert Favre, younger than she is, a flautist who is as interested in the indigenous music of the region as in Violeta and who becomes her companion. Though they create and perform and travel together, in Paris she tells the curator at the Louvre that what Gilbert does is make her frames. She struggles to maintain a relationship with Gilbert, and his figure provides just the right level of ambiguity to let us wonder about Violeta’s desires in relation to her own tempestuous personality. travel as they fall in love — yet with a twist that undercuts it from the outset. This irony is due to the lyrics of the song, which she actually wrote quite some time after their budding romance, but which Andrés Wood uncannily inserts exactly as Violeta unleashes her desire for the man. Again, sound precipitates images: as the song is sung (off-screen), the scenes we see show joyous fidelity, all the while the song’s lyrics wryly point elsewhere. 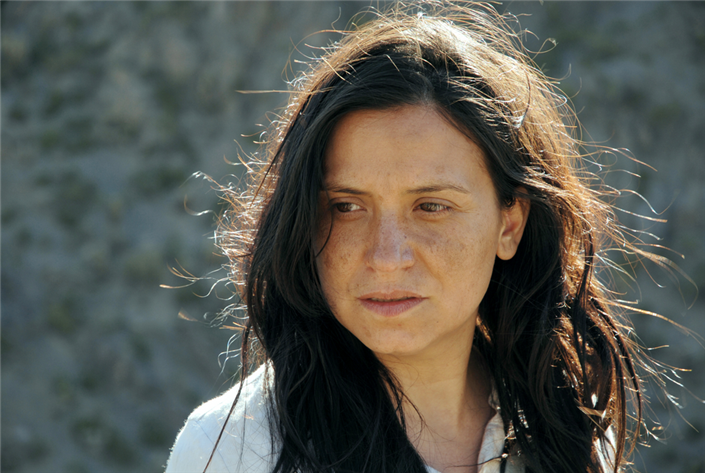 This boldness in Wood’s writing and editing — whether in scripting the dialogue of the TV talks or in using Violeta Parra’s lyrics as foreshadowing counterpoints — bravely endows her with a sixth sense, but one that devastates her. It sets her apart from the celebrity world and her domestic world, situating her in nature, but somewhat mythically. For us to take in all these realms together is a heady, somewhat surreal experience, and one not easily forgotten. The same sensation can be felt in her songs. 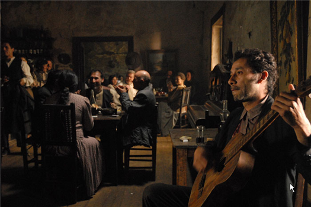 “El gavilán” (“The Sparrowhawk”) moves with broken words, repeated syllables uttered haltingly to its counter-rhythms. It taunts. It warns. 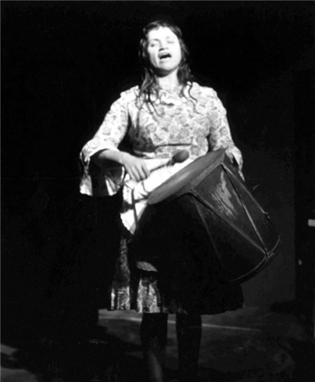 We all but swim in Violeta Parra’s compositions as their chanted melodies engulf us in the contradictions that make the woman, and a song like “El gavilán” hits us as a lover’s wrath, a poor mestizo’s lament, and a nation’s or a woman’s rebellion at once. “Run Run se fue pa’l norte” (“Run Run Went to the North”) also registers simultaneously as a diary entry and an economic critique. The same can be said of “Gracias a la vida.” Is the song meant to be personal, social, or historical? Is it genuinely grateful and celebratory or sadly ironic? 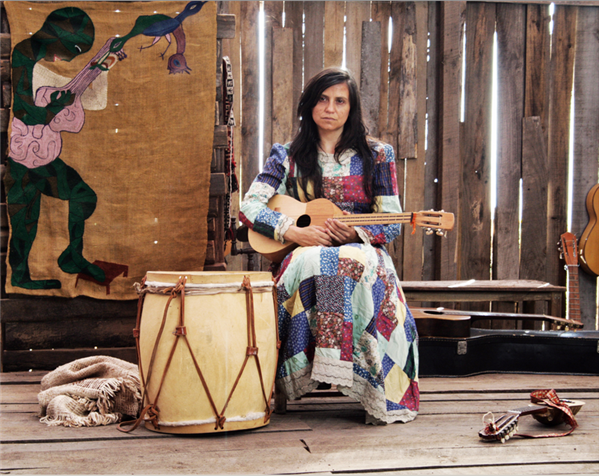 It is Violeta Parra, and maybe that is all that matters. And from within the multitude the one that I love. Director: Andrés Wood; Producer: Alejandra Garcia; Screenplay: Eliseo Altunaga, Rodrigo Bazaes, Guillermo Calderón, Andrés Wood; Cinematographer: Miguel Ioan Littín (aec); Editor: Andrea Chignoli; Sound Design: Miguel Hormazábal; Music: Violeta Parra; Production Designer: Rodrigo Bazaes; Costume Designer: Pamela Chamorro. Cast: Francisca Gavilán, Cristián Quevedo, Thomas Durand, Luis Machín, Gabriela Aguilera, Roberto Farías, Patricio Ossa, Stephania Barbagelata, Marcial Tagle, Jorge López, Roxana Naranjo, Francisca Durán, Guiselle Morales, Juan Quezada, Sergio Piña, Sonia Vidal, Ana Fuentes, Pablo Costabal, Juan Alfaro, Pedro Salinas, Daniel Antivilo, Eduardo Burlé. Color/B&W, 35mm, 110 min. In Spanish, French, and Polish with English subtitles.